I seem to be perfecting Sympathy cards this week (expect another this coming week). I think most people throw away birthday cards, graduation cards, etc. but I imagine most Sympathy cards are kept for many years. It is just something a person can pull out and read on days when they are missing a loved one. 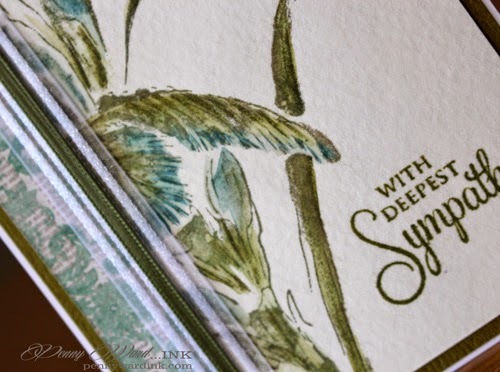 This gorgeous stamp was first colored with Memento markers, spritzed with water, then stamped onto watercolor paper. I took a wet paint brush to move some of the ink around. I also used a slim strip of pattern paper down the side and covered the seam with ribbon. Thanks so much for stamping by today. Love how you used a portion of that stamp. And you are so right about people keeping sympathy cards. This one is lovely. Beautiful card! Really like how you colored the flower! 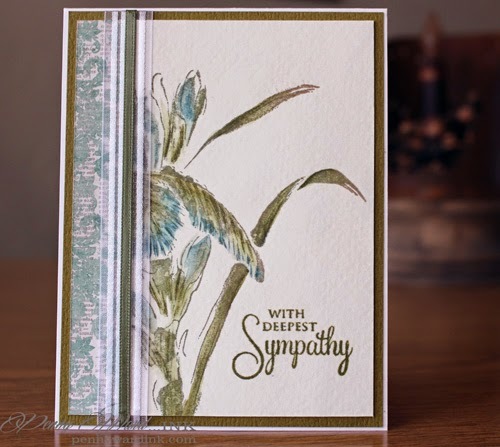 Gorgeous and simply so peaceful - your colored flower is remarkably done and I just love the whole feel of this card!! !